I’m fairly addicted to Twitter, mostly because some of the people I follow provide a humorous break from reality. I recently saw a tweet about a hospital bill for childbirth. The year: 1951. 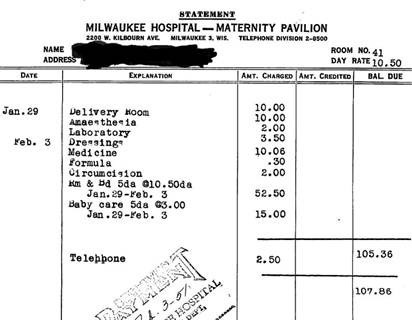 Ever since I was an intern, I’ve found the history of maternity care in the US to be fascinating (most likely due to all the long hours spent on the labor and delivery floor). I’ve delivered a couple hundred babies and know what charges look like today, so decided to see what this bill would look like in 2013 dollars. Of course, you can’t truly compare apples to oranges against a modern hospital bill, because there is no way you’d be allowed to stay for five days for a normal, uncomplicated delivery. Most commercial payers in my area require patients be discharged no later than 48 hours after a non-surgical delivery and many encourage only a 24-hour stay. You also can’t compare apples to oranges because payment was made on the day of discharge. No billing or insurance was involved. Paying this bill at discharge would be equivalent to asking a patient to pay nearly $1,000 today and most patients would balk even at that. We’ve become dissociated from the true cost of medical goods and services to the point where if it costs more than a $20 copay or $500 deductible, we can’t fathom paying it. What do cash patients pay today? A quick Google reveals a two-day labor and delivery package at Tucson Medical Center for $2,300, but only if paid in advance. My hospital offers a similar package that’s priced about the same. Still, that’s more than double the expected price given inflation alone. Incidentally, while researching this, I learned that my hospital refuses to accept cash as a form of payment. That’s a sad commentary on modern life. Of course there’s a theoretical risk of counterfeiting and you have to have cash-handling policies, but I’d rather have that than the risk of a bounced check or have to bill patients who don’t have credit cards. I don’t want to get into a debate about natural childbirth here, so let’s assume you’re a patient who wants a “standard” hospital birth. When you consider the modern technology associated with today’s labor and delivery experience, it doesn’t look like such a price hike. In 1951, the anesthesia used at our hospital was Twilight Sleep and was likely to result in maternal amnesia and infant breathing problems. Today, patients who want it can have continuous fetal monitoring, epidural anesthesia, and highly skilled nurses who are experienced with challenging deliveries and resuscitating depressed infants if needed. Laboring mothers can move from bed to shower to chair to bathtub to labor ball rather than just lying on a gurney. Whole families can share in the delivery experience and babies are able to instantly bond with their mothers. How then do we translate this to the exorbitant bills we’re seeing from hospitals today? The key difference (besides patient care technology) is the rise of the insurance company and our resulting detachment from the cost of the care we’re receiving. Hospitals and offices must maintain armies of coders, billers, processors, and all manner of clerks, insurance follow-up representatives, patient accounts representatives, etc. just to stay in business. This in turn drives up costs and perpetuates the hamster wheel on which we run. I have a few good friends who have gone to cash-only practices. I’m not talking about “concierge” or “retainer” practices where the patient pays an annual fee for access to the physician. I’m talking about physicians that know the true cost of their services and what income they want to achieve and charge accordingly. It’s surprisingly affordable, with office visits in the $40-$50 range. They’re bringing home good money with a higher quality of life. Payment is required at the time of service and no bills are generated. One of my colleagues does provide a copy of a superbill for the patient to submit to insurance, but the others do not. One has a nurse, one has a medical assistant, and the other has no staff at all. Interestingly, despite being “off the grid,” all three have electronic health records and demonstrably high quality of care. They use their EHRs to enable their workflow rather than to count bullet points and participate in regulatory nonsense. I’d love to spend some time looking at the true cost of hospital care and modeling what it would look like if third-party payers (and the resulting bureaucratic bloat) were out of the mix. Patients would be closer to the actual costs of procedures and would be better able to determine if it’s worth it to keep grandma in the ICU for her last weeks or whether it would be better to spend a fraction of the money on a hospice nurse tending her in her own bed. Of course, there would be those crying out that we’re refusing to care for the poor or elderly if we did that. I would argue that some of our high tech interventions aren’t done so much in the name of “care” as much as “because we can.” I’m not arguing that we should deny care to those who can’t afford it, but merely suggesting that if patients (and facilities) were more in touch with the actual cost of care that we’d be in a very different situation than we are now. As a family physician is wont to do, I’ve told the patient’s story from cradle to grave. I’m interested to see what the tale looks like for the next generation.